Automic allows parents to set permissions for their children to access autonomous vehicles. For example, a school age child might be allowed to go to an ice cream shop, but only after homework is completed, and not after 7 PM. As young people grow older and more responsible, their parents might allow them additional privileges, like an allowance of range, miles, or new destinations. New destinations could be used to reward children for their achievements. Conversely, parents could also choose to replace mobility constraints to punish bad behavior. 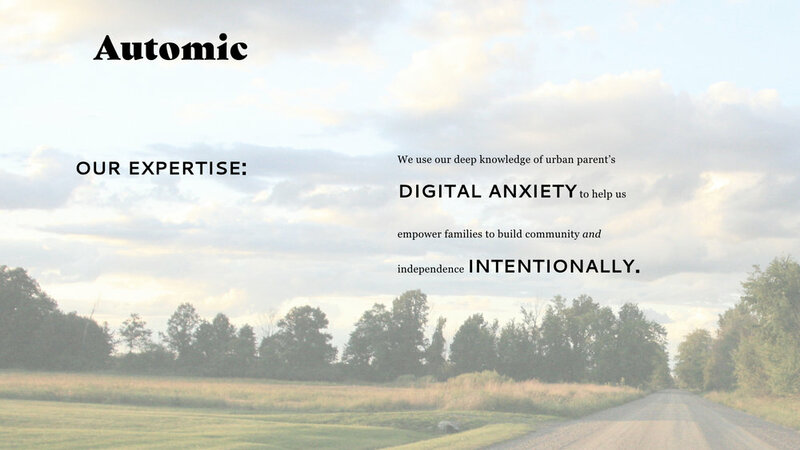 Automic is a service that allows parents to responsibly manage their chilrdren's mobility in a world of ubiquitous self-driving cars. In the not so distant future, children ten years of age or even younger will be able to summon cars and travel without relying on their parents. While children will benefit from greater independence, they may be tempted to abuse this new privilege. Many children are already allowed to roam free... on the internet. While cyberspace offers many enriching actives for youth, many children are exposed to crass and exploitative materials by companies like Youtube and Google, who are only now starting to grapple with the consequences. The Automic Family Management Service is a speculative effort to give parents control over their children's mobility privileges, so that they can have a healthy and nurturing relationship to mobility. Automic can realize it's goal of giving families a responsible way to manage their children's travel within a scalable and lucrative business model. For example, the service might help parents and children discover relevant events and venues, and take a marketing fee for promoting them. Automic does not own any vehicles itself, but instead dispatches ride hail requests to existing mobility providers. Automic may take a finders fee for this service. Finally, Automic might charge parents a fee to help them manage their children's mobility privileges. The Automic Family Management Service can be delivered through a digital touch screen globe I developed for use in the home. It is designed with an upper screen, accessible only to parents, where children's mobility options can be managed. Kids can reach a screen positioned lower, where autonomous responsibilities are displayed, and vehicles can be hailed.